I have recently been reading Colin McGinn's book Shakespeare's Philosophy. The opening chapter provides a really good overview of some of the philosophical questions that appear to have interested Shakespeare. As background to my series on Shakespeare's comedies, I thought I would provide a summary of McGinn's opening chapter. This material should be of interest to all, irrespective of their feelings about Shakespeare. McGinn argues that there are three philosophical themes permeating Shakespeare's plays: (a) Knowledge and Scepticism; (b) the Self; and (c) Causality. Let's look at each of them in turn. The quest for knowledge is central to human existence. Aristotle argued that it was a natural desire we all share. That may be an over-generalisation, but it seems to ring true. Knowledge is a normative concept. In this sense, it is useful to distinguish it from information, which is not normative. Information can be true or false, good or bad, useful or useless. Knowledge is true, good and useful. Information is ubiquitous; knowledge is rare. So there is a problem: we have imperfect access to what is true, good and useful. Our senses often mislead us, as do other people. This has been a perennial philosophical concern, present in the sayings of Socrates and the writings of Plato. Socrates, in particular, was sceptical about those who claimed to be in the know. The problem has seemed so acute to some that they have dismissed the quest for knowledge. The school of thought known as Pyrrhonism, for example, argues that it is irrational to believe in anything, given our knowledge-accessing problems. Shakespeare was exposed to the writings of one arch-sceptic Michel Montaigne. Montaigne wrote brilliant essays that fused personal anecdote with serious intellectual concerns (he should be an inspiration to all bloggers!). In a famous essay "An Apology for Raymond Sebond", Montaigne expertly articulated the sceptical position. McGinn argues that Montaigne had a profound influence on Shakespeare. In addition to this, Shakespeare is himself an expert articulator of the problem of other minds. This concerns our difficulties in knowing what others are thinking, plotting, hoping and intending. The plays are replete with characters who misunderstand each other. Indeed, the comedies are usually premised on misunderstanding of some sort. Drama is all about selves. A play is usually an assemblage of characters or selves engaging in activities and events. These activities and events constitute the "plot". The question that arises is whether the self remains constant throughout the plot or whether it is changed by the plot. McGinn argues that Shakespeare is sceptical of the notion that the self is a constant, definite, singular "thing" or "essence". Instead, McGinn suggests that for Shakespeare the self is interactive and theatrical. It is interactive in that it never makes sense to talk about the self in isolation. The self only becomes apparent in social interactions. For example, if we describe someone as being generous, what we mean is that they behave in certain ways towards other people. It is theatrical in that it is best understood in terms of the roles a person plays in life. This idea is manifest in the famous Seven Ages of Man speech in As You Like It. We treat life like a stage play in which we play different roles, each designed to make an impression on an audience of some kind. We are familiar with this: we all put on a different "act" depending on the people we are with. The final philosophical concern of Shakespeare is with causality. Causality gives structure to the events and processes through which we live. The philosophical concern is with the search for some overarching causal principle that explains the structure and sequence of all events. We can distinguish between two types of overarching causal principle. The first would be a teleological principle. This would explain events in terms of the whims, desires, preferences or intentions of some agent, usually God. This principle imbues events with great moral and ethical significance. For example, if a battle is won, it is because God favours us; if a person is injured, it is because God is angry. The second type of principle would be naturalistic and amoral. It explains events in terms of mindless processes and mechanisms (see here for more details). What morality and purpose there is in the universe is projected onto it by us, it is not out there. This is an atheistic view, one that I personally share. McGinn argues that Shakespeare is sceptical about teleological causation. In his comedies and tragedies he seems to reject the idea that there is rational purpose or order in the universe. The universe is unruly, morally blind and even sometimes unintelligible. McGinn thinks that this scepticism is what gives Shakespeare's plays their great worth: they challenge complacent views about causality. You said, differentiated knowledge and information. You made Knowledge to be "true, good and useful." Is this a whole school of philosophical thought? Is your "Knowledge" a special sub-set of "Information"? How is it normative? Sounds like the moral code behind the universe sort of thing? But I am weak on such discussions and perhaps you can point me to others that feel the same. Thank you. Wow, though I have seen several I have never read Shakespeare but have always wanted to study him -- someday. This essay helps. It seems Shakespeare shares my view of "self" which is central to my worldview. You said it very well here, I say it very dryly on my site. Ah the beauty of literature. 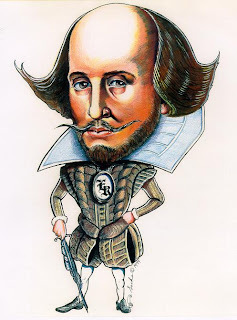 Your essay (and McGinn's insights) have made me a new fan of Shakespeare -- thank you. I will be sharing you on my site today. Thanks for sharing me. I hope to return the favour someday (I don't have many readers yet). Your post on the self is very good. I like the illustrations, but then again I'm a sucker for that kind of thing. As for knowledge being normative, I do not mean it should be conflated with moral norms. What I mean is that phrases like "I know X" carry with them a certain authority or weight. You are saying more than simply "I have read about X" or "Somebody told me X". These two cases would be akin to saying "I have information about X". Scientific knowledge is normative in this sense, but it is not normative in a moral sense, i.e. it does not prescribe conduct. I think the distinction corresponds well with the classic definition of knowledge as justified true belief; as something more than mere belief in X. There are problems with this definition, but it would open a massive can of worms to explore them. "Refers to value judgments as to "what ought to be," in contrast to positive which is about "what is."" So I would say it does not care a degree of subjective certainty, but that is all. "Justified true belief" seems a bit arrogant. None of these are the way I think about stuf when I say "I know..."
I am new to this whole blogging thing and stumbled on your page when browsing the internet. I had some posts on Google's blogspot for a little over a year and got maybe 50+ views... The tracker at the top of your page really didn't help my esteem when you said that you do not have many readers. That is really beside the point though, because I was happy and a little surprised to hear about Shakespeare's philosophy of self. I find myself in agreement with his idea that the self is not a 'constant and singular thing or essence.' I have been writing a philosophy of self - of sorts - and if you agree with McGinn and Shakespeare yourself, I hope that my writing can prove to be of interest to you. This paper is related to everything else that I have recently transferred to wordpress in one way or another. This paper in particular talks about a non-duality between an internal sense of self and an external reality. If you bear with some of the terminology that I use in the paper, I argue that the self is always in a state of flux and that the inter-related parts of the whole influences the self in much the same way that your post argues. This inter-being of the self also only presents itself in inter-actions in ways that demonstrate self-identity to be something apart from our physical bodies. The one aspect that I think you may find to be in conflict the views presented in your post is a sense of causality. There are parts of my paper that bring this into question, but my argument isn't for what is traditionally considered teleological. Please to not be dissuaded by my Hume-esque critique of causality though, because if you read further into my writings you will find that my questions about how matter can mysteriously turn itself on, by virtue of an agency of its own, is something which also evolves and changes along with the matter itself ... That last part was probably confusing, but do not let it get in our way of the pursuit of truth because I would welcome any critique of it you may have.